This post is going to work a bit differently than the others. Due to the amount of Indie titles that Microsoft showed on stage we’ve collected the majority of them into this one post. Hopefully you’ll find something in here to look forward to. A PC hit that pits a large number of people against each other in a free-for-all environment. Form a group to survive or lone wolf your way to victory. The game will be a timed exclusive for Xbox One when it releases later this year. Deep Rock: Galactic features procedurally generated missions for up to four players as you mine and attack with your group of Dwarves. The game will come to the Preview Program in 2018. The Darwin Project is another free-for-all title, although on a much smaller scale than Player Unknown’s Battlegrounds. In this game you fight against other players and the environment to become the last one standing. Gameplay demos show a third person combat system that seemed to be similar to Overwatch. No release details have been given for this game. Black Desert is an MMORPG making its way from PC to Xbox One. This says it will be an “Xbox One X Exclusive launch title” coming in early 2018. That likely means it’s a timed exclusive that plays better on the X. This one is a 2D pixel art game with a Cyber Punk theme. Hardly any details are available with no news for release dates. This one is a bit weird. The Artful Escape features a character named Francis Vendetti as he works to become a famous musician. Although this is far from the Rock Band vibe that sounds like it would be. This seems to be more of a platforming adventure game than a music title. We really don’t know anything, and the last few seconds of the trailer makes the release window perfectly clear it’s not soon. 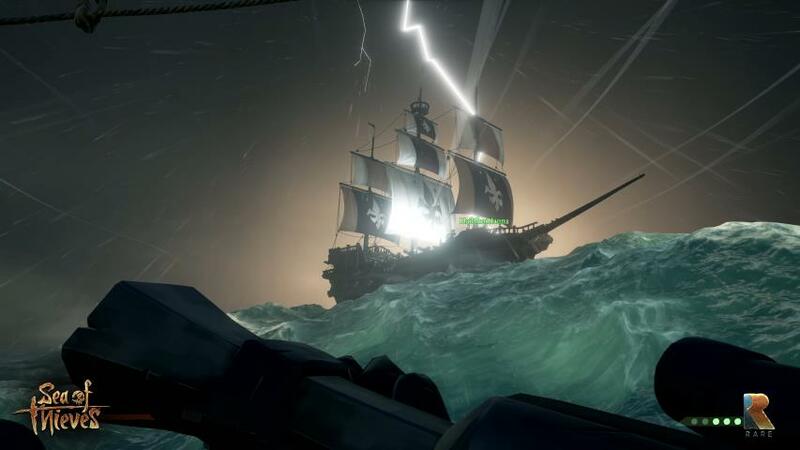 Not necessarily an Indie title, but Sea of Thieves fits right in with the art style of this post. Rare released nearly ten minutes of new gameplay this time showcasing the teamwork required to get things done. Someone holding a chest or light can’t fight the enemies that appear so someone else has to protect them. Then you have to worry about other players stealing your ship so it’s smart to leave one behind to defend it. If this is a game you’ve been looking forward to then enjoy the trailer. Code Vein is a new J-RPG which the Xbox gets very few of. Leading up to the reveal the publishers teased the “Prepare to Dine” phrase suggesting the possibility of a Dark Souls style game. It appears to play much like those games, with the twist of an anime theme. It’s certainly worth keeping an eye on if you enjoy the Dark Souls series. Code Vein has a 2018 release schedule. Originally teased in the 2015 E3 conference, Tacoma is a story based on recovering the AI of an empty space station in the year 2088. The biggest news about the game is it finally has a release date, which is August 2nd of this year. It also appears to be a console exclusive for Xbox. Super Lucky’s Tail is a coin collecting platformer with a colorful world to explore. It will be Xbox One Exclusive and release on November 7th of this year. One of the ID@Xbox games that has been in limbo for a while is Ashen. Another trailer for the action RPG shows the grim world and challenges you’ll face. Once again, there is no news on a release date. Of course a Microsoft conference at E3 can’t end without a montage of ID@Xbox titles they couldn’t get to. Here’s the trailer below. Tagged Ashen, Black Desert, Code Vein, Deep Rock Galactic, Player Unknowns Battleground, Sea of Thieves, Super Lucky's Tale, Tacoma, The Artful Escape, The Darwin Project, The Last Night.